Now Open: Our new three-story Annex with 16 additional guestrooms and the cozy Sand Bar nestled among the dunes. Now open: Our new three-story Annex! It mirrors the original hotel with its classic coastal cedar shingles and white trim. Inside are 16 additional guestrooms with bathrooms. We also added The Swingers Lounge Golf and Fitness Center – a virtual golf center by Foresight Golf, complete with a launch monitor and golf-specific workout area. Golfers can also enjoy a new 20,000-square foot putting green, designed with dips and swales. Nestled between sand dunes and rolling hills, we invite you to visit the new Sand Bar for a handcrafted ale and burger in this cozy bar, complete with wood stove. Take note of the one-of-a-kind bar top, crafted from a tree struck by lightning at McMenamins Cornelius Pass Roadhouse. And there’s more: We added an expansive deck just outside the Pro Shop to welcome golfers starting (or finishing) their round, as well as a great place for anyone to sit and sip. 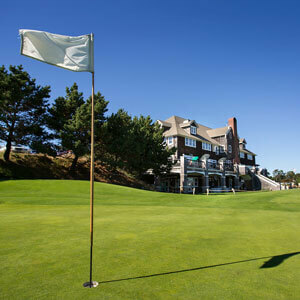 Just four miles north of Seaside along the northern Oregon Coast, Gearhart Hotel is situated adjacent to the 18-hole Gearhart Golf Links—one of the oldest courses west of the Mississippi—and just across the dunes from the Pacific Ocean. The 18 guestrooms feature king- or queen-sized beds, as well as private bathrooms and televisions. McMenamins' signature artwork adorns the rooms, integrating Pacific Northwest coastal style. The Sand Trap Pub on the main floor offers breakfast, lunch and dinner every day. Stop by for a casual meal after a round of golf or before a day at the beach. Have a cocktail or clam chowder on the patio next to the firepit, or duck into the Pot Bunker Bar, a cozy lair adorned with antique golf clubs. Or ask for a meal to go and enjoy it on the beach. In addition, event spaces are available onsite for weddings, meetings and events. For some lively fun, check out our schedule of seasonal free music on weekends. Gearhart Hotel allows pets at select tables on the back patio, and in hotel rooms for a $15 fee. Guestrooms at the Gearhart Hotel integrate McMenamins’ signature artwork with Pacific Northwest coastal style. Rooms feature king or queen-sized beds – or relive your childhood for a night in one of our bunk bed rooms. In all guestrooms you’ll also find private bathrooms, televisions and usb plug-ins. Bring your best friend to stay in one of our designated pet-friendly rooms. Our newly constructed, three-story annex sits adjacent to the original hotel building. The Annex features 16 additional guestrooms with bathrooms. Overnight guests are eligible for discounted greens fees at Gearhart Golf Links – up to $40 per foursome. When checking in, simply get the Resort Guest Card; one may be redeemed for each round of golf. You may use the discount on the day of check-in and each day through check-out. Add 8.8% state and county lodging tax to all room rates and overnight packages. Gearhart Golf Links is an 18-hole, public course – everyone from daytrippers to pub guests to professional golfers are all welcome! Call to reserve your tee time. Overnight guests will be eligible for discounted greens fees at Gearhart Golf Links – up to $40 per foursome. When checking in, simply get the Resort Guest Card; one may be redeemed for each round of golf. The original Hotel Gearhart, built in 1890, was a popular summertime retreat for wealthy Portlanders and their families. Within a year or two, an informal golf course was laid out nearby (which evolved into today's 18-hole Gearhart Golf Links). The hostelry burned down in 1913, as did it successor, two years later. The third Hotel Gearhart opened in 1923, and remained an Oregon Coast landmark until being razed in 1972. For decades and generations, the Sand Trap has been a lightning rod for camaraderie and epic gatherings of golfers and non-golfers alike. The place has survived dire economic downturns, war, even calamitous fire. In the context of the history of the remarkable beach community of Gearhart and a rich tradition of golf that predates almost all others in the Western United States, the Sand Trap's saga brims with some of the greatest characters, achievements and antics of the region. Read more about Livingstone the Scot, a Headless Horseman of Halloweens past, Sittin' Seagulls, night putting and paper chases. Who wouldn’t love a wedding by the sea? Or celebrating the big day on the rolling green links of a gorgeous golf course? Why not enjoy both? You and your guests will love this historic setting on the Oregon coast, just a short stroll away from the breathtaking Pacific Ocean. Imagine the stunning photos you'll have, set against a dramatic beachscape, the velvety green links, and bright blue sky. The Gearhart Hotel offers outdoor weddings, a large indoor event space as well as an expansive manicured lawn overlooking the first hole of the Gearhart Golf Links. Accommodations are available onsite in one of our 18 well-appointed guest rooms.